The easiest way to include fresh garlic in your diet seems to be to add it to a drink. But it’s not obvious how to do that without ending up with a rather horrifying drink (depending on your level of interest in a spicy taste). I made a banana shake with garlic, but that was too spicy for me. I wasn’t ready to give up on the idea, however, banana shake being such a yummy and easy drink so I experimented. I am happy with this result so I thought I’d share it. Another nice aspect, depending on the ingredients you use, is that it comes in at under 180 calories, which is helpful if that’s something of interest. It’s 3g protein, which is not great, but it’s better than a glass of water or tea. You can certainly improve on that by switching out the almond milk with regular fat-free milk, but then you’re also paying in terms of calories (30 vs 80). And of course you can switch out the non-dairy chips for dairy-chips, but again, different caloric intake, and then it’s no longer a vegan recipe, in case that’s of interest. At the end of a long day, I found myself hungry, but explicitly not craving any type of meat or dairy products. That almost never happens to me so I must have been unwell. Fortunately, I was still craving garlic, roasted, something dry. So then what? I did some searching for recipes, but with the added limitation of a broken oven, I didn’t find too many options. I decided to experiment. 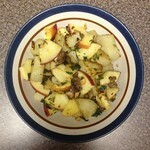 I was very happy with the result and look forward to making it again in the future as a side dish. It looks like this may qualify as a vegan recipe. 2. In a pan on medium heat, pour in the olive oil, add the mushrooms and garlic, top with the chives, basil and remaining 1 tsp salt. Cover, but do stir occasionally (with the cover lifted;). 3. A few minutes later, add in half a cup of white wine. Keep stirring. Add in the potatoes. Stir some more, put cover back on for a few minutes. Add the apples, continue stirring. 4. When the potatoes are starting to get brown on the edges, remove from stove. As I kicked off my 31 Days of Garlic challenge, I knew there would be days when work would only allow me to get creative for breakfast so I started looking for recipes that went beyond the usual scrambled eggs or omelette suggestion. 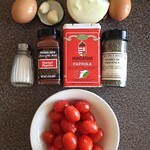 This is how I stumbled onto Shakshuka, a Middle-Eastern breakfast dish. I recall seeing this at breakfast in Jordan when I was there last February, although I don’t think I ever had it as there were so many other yummy breakfast options at our wonderful hotel (the Mövenpick in Petra). 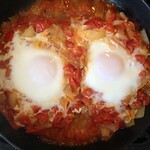 The above-linked recipe calls for four eggs, which I knew I would not consume. I also didn’t have all of the ingredients on hand (like zucchini). Having read the reviews on AllRecipes.com for that dish, it became clear that you could get creative and still end up with a good result. 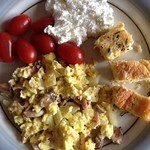 Below is how I prepared the dish, it was delicious and a nice hearty breakfast to get my week started off on the right foot. 1. Pour the oil in a pan and add the garlic plus onions. Stir for a few minutes until the onions are beginning to get translucent. At that point, add the chopped tomatoes and the spices. Cover and simmer for about 10 minutes. 2. 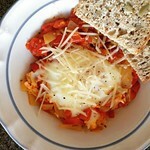 Create two little craters in the sauce to make room for the eggs (see picturse below). Since you don’t have that much sauce, this may require moving some of the mixture around. Add one egg to one crater., the other egg to the other crater. Do not mix. 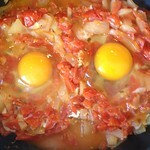 Cover and cook until the eggs reach desired consistency. Serve with bread. I also added some Parmesan once served. I like garlic and I’m also convinced that it has health benefits. I’d like to make fresh garlic a regular part of my diet. I realized that I’m not traveling at all in January so I will have more say in what I eat than is often the case when I travel. Thus my 31 Days of Garlic challenge was born. I’m fine with repeating approaches, but I’d also like to spice things up a bit (sorry). Will you help me? Do you have some favorite dishes that include fresh garlic or that could include fresh garlic? I’m especially interested in relatively quick and easy recipes (lots of work things coming up in the next few weeks) and ones that don’t involve an oven (as mine needs repair). But I’ll have some downtime as well so don’t hesitate to share trickier ideas. On the 1st of the year, as is the Hungarian tradition (shared by other cultures), I made lentil soup for good luck. I don’t usually include garlic, but I did press a clove into it and it worked well. The pictured soup is missing a usual ingredient, carrots. I didn’t have any at home, but sauteing some onions, adding various spices, adding the clove of garlic and some sausage resulted in a very yummy dish. On the 2nd, I added a pressed garlic clove to my tea. 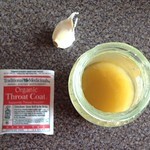 It’s a palatable way to have it, certainly the quickest way I know to include it in my diet. A teaspoon of honey is also an important component of that mixture. The particular tea I have on the image is especially good for soothing the throat (or so I was told by someone who works in theater and I’ve found the recommendation helpful). What should be next for my 31 Days of Garlic challenge? I’ll be posting pictures of the dishes/drinks on my Instagram. 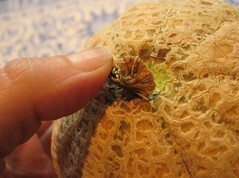 I just had a deliciously sweet cantaloupe. How did I know how to pick it? My favorite* chef, Chef Susan aka Chef Q posted some advice on the topic recently. Not only is she an amazing cook and baker, she is also an excellent photographer so her posts are illustrated with helpful images. I forgive her for all the pounds I gained last year due to her cooking (hey, at least I finally started a regular exercise regime) and thank her not just for all the great meals I’ve had the good fortune to experience, but also the helpful material she shares online. [*] Itâ€™s actually a tie with my Mom, but sheâ€™s not officially a chef. Of course, that hasnâ€™t stopped her from publishing a cookbook (see some of her recipes here). A lot of people I know are heading to Budapest these days (whether for pure touristy reasons or for one of the many meetings being held there) so using the My Maps feature on Google Maps, I’ve compiled some annotated recommendations for visitors. These include pastry shops mostly visited by locals with desserts to die for. No, seriously, these are a must and visiting the city without going to some of these would be sad and wasteful. I also include a pointer to a grocery store with the goal of finding the Hungarian snack Túró Rudi (details: check the dairy section for items that look like a candy bar in a red-dotted wrapper). I would say it’s the most missed item by Hungarians abroad. It’s basically lemony sweet farmer’s cheese coated in dark chocolate. Yum! Wikipedia conveniently has more info, not that words can possibly convey the experience. Some companies new to the country in the ’90s have tried to create other versions (e.g., with fruit filling or milk chocolate coating), but I would rather not even acknowledge those as they’re ridiculous imitations. On the topic of grocery stores, someone recently complained that they couldn’t find any fruits and veggies in them. That’s because other than the gigantic supermarkets, these tend to be sold in separate venues. I didn’t bother listing most of the traditional sights included in guide books, numerous Web sites and guides will point those out. I do highlight, however, an incredibly touching Holocaust memorial on the Danube (first link on my map). It’s relatively new and not something one would stumble upon by chance, yet definitely worth visiting and now you know where to find it. I’m hosting a chocolate birthday party tonight (I can’t believe it’s taken me this many years to think to do it!) and am not sure yet how to handle the logistics of the blind taste test. I guess it doesn’t have to be that complicated, but if anyone has any experiences and lessons learned, please share. I’m supplying about ten types of chocolate (from high-end to not exactly) and guests will bring their own contributions. I’ll remove the wrappers and place the chocolate on plates. I figured I would number these and hand out sheets where people can rank order. But perhaps they should just comment and rate. I’m not sure. Any thoughts? Part of the point is to see who decides that their absolute favorite is the cheapest relatively generic brand vs the super special imported variety. I’m also looking for any additional ideas for such a party. I’ve gotten some nice chocolate Q&A cards that I’ll spread out across the place. I’m making some large printouts of chocolate photos (using this nifty tool). And I’ll likely have a couple of fondue pots going thanks to gifts from previous birthdays. Of course, I’ll have plenty of other food (and not just sweets!) and drinks (spiced wine anyone?) to allow people to cleanse their palettes between morsels. Anything regarding the chocolate theme that I should add? Giving credit where its due: the chocolate party blind taste test idea comes from my friend Diane who hosted a very successful version back in grad school so it is a tested concept. I just don’t remember the logistical details. Apologies as this is too late for readers outside of the Americas, but hopefully still in time for some. Here is my blog entry from exactly four years ago. All the best for 2007! Hungarian tradition has it that the first thing you should eat in the New Year is lentil soup. The idea is that the New Year will bring you as much in riches as the number of little lentils. The original idea is fully focused on money. That’s a bit materialistic for my taste so I’m going to think about it in a larger context of riches of all kinds. So I’ll be making lentil soup today and sharing it will all those who are joining me for New Year’s celebrations. Here’s the recipe in case you’re interested in joining in on the tradition. Take the lentils and after cleaning/sorting let stand in water for an hour. Chop up some onions and saute in oil until transparent. Add the lentils, some paprika (ideally Hungarian paprika for authenticity:), and a bit of salt. Then add quite a bit of water (but don’t fill up the pan completely as more things will be added). Let cook for about 15 minutes. In the meantime, chop up the carrots. 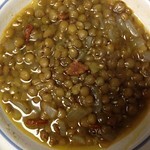 Add to the soup and keep cooking until lentils are soft. Take a bit of flour (1 tbsp) and mix it with a bit of water (2-3 tbsp) until smooth. Add a few tablespoons of the hot soup to it and mix some more. If you are a meat eater you can add some cut up hot dogs and cook for another five minutes. Add a bit of vinegar (start with no more than 1tsp) and a bit of sugar (1 tsp). Finally, take some sour cream, mix it til smooth and add to the soup. Cook for another minute or so then let sit. Let sit for several hours before consumption. With that, I wish you all the best for the New Year! I was at a restaurant the other night and noticed that their featured wines for the day (the week?) were Hungarian ones. I thought that was interesting. I didn’t recognize any of those wines, but I’m pretty ignorant when it comes to wines so that’s not too surprising. 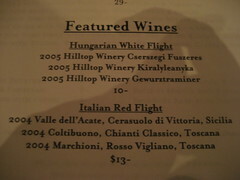 I did look through their entire wine list and ordinarily they don’t have any Hungarian wines. When I took the photo, I thought the shadow of my hand taking it might look interesting. (I didn’t have too much choice over the matter, but I could have minimized the interruption.) In the end, I don’t like it, but so it is. We get great lunches at the Center thanks to our wonderful chef Susan Beach. On Thursday, we had more food (and thus more desserts) than usual due to the Board meeting. 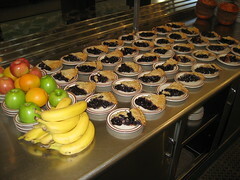 Dessert of the day was blueberry pie with the usual option of fruits. Each day, we get amazing soups, entrees and salads in addition to a yummy dessert. Susan is selling calendars with her most requested soup and salad recipes, it’s worth checking out on her Web site. I’m not about to cut chocolate out of my diet, but it would be nice to reduce calory intake somehow. A while back I decided to give up drinking sodas. I haven’t succeeded 100%, but I have gotten pretty good over time. I used to consume a can of Coke several times a week with an occasional Sprite thrown in there as well. Now I only have such a drink once or twice a month. I certainly have not lost 15 pounds by not drinking soda, but I wasn’t drinking it daily and I haven’t cut it out 100%. Still, it’s a helpful figure to contemplate. I have gotten better about drinking water, but I have also discovered a nice alternative. (And I’m hopeful no one on this blog will point out to me the downsides of said alternative, but go ahead, enlighten me.) To add a bit of taste to my beverage, I add a tiny bit of lemon juice to the water. No sugar or anything else, just a bit of lemon juice. It works well, I recommend it. At least some people can recall their grad student eating experiences (then again, are these experiences you necessarily want to recall?). For me, several years are a complete blank. What saved me was a fellowship in my fourth and fifth years that came with money to be spent at the student center cafeteria. It was more money than you could possibly want to spend in the dining hall so you ended up inviting friends. That was a nice perk. Unfortunately, it was only after my fellowship with that program had run out that we realized you could spend those points in the faculty dining room eating good meals. Not that I’m complaining. At least I had some regularity in my eating habits for those two years. [*] If I didn’t happen to own symmetry.org they could have a much cooler URL. It’s not hard to find discussions among bloggers (and others) about whether blogging has any benefits. Last month, I happily encountered a very clear material benefit to blogging: chocolates! A kind reader of this blog noticed that my birthday was coming up and proceeded to send me some very yummy chocolates. Thank you, dear reader, ’twas a very nice surprise, and rest assured, the chocolates have been treated with utmost respect. I have a pretty good track record in this realm. That’s mostly because I tend to suggest bets only in cases where I am quite certain of the outcome. This often happens in the realm of art. I am no art expert, but my knowledge is not too bad for a non-expert. For example, it didn’t take me long the other day to start wondering about the supposed artist behind this sculpture depicted on a Flickr photo. 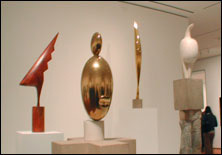 The Flickrite suggested it’s a Dali, but I was quite sure it was a Brancusi. The little evidence I could find backs up my hunch. But in this case there was no one around for a bet. Please note that I have posted the chocolate photos in very high resolution versions on Flickr so you can appreciate the details in their larger-than-life glory. For masochists, the Moonstruck chocolate photo may make an interesting computer wallpaper. I got to meet a fellow blogger in person finally yesterday. We met up at Ethel’s Chocolate Lounge in Evanston, a place with enough chocolate to keep you coming back for a while. I hope Ethel’s is not considering providing free wifi. That would lead me to spending way too much time there. I’m going to be having people over for my upcoming birthday and want to make chocolate fondue. Does anyone have any tried and true recipes? Thanks to some gifts from birthdays past, I am well equipped with the necessary pot and accessories. I just need a super recipe now. (Yes, I know how to search for this stuff, I’m looking for recommendations of things that you know work. :) Thanks! For the first time in a few years I will not be hosting Thanksgiving dinner. Although I love to play host, this worked out well since I was teaching all day yesterday up until 5pm, which does not leave much room for preparation. That does not mean I will not be cooking. I will be contributing three dishes to today’s feast: rosemary mashed potatoes and yams, roasted squash with potatoes and garlic (you have to log on to Wegmans.com to access that recipe), and a pecan pie. These are just a part of my usual Thanksgiving meal. Browsing people’s Flickr accounts I came across pictures from CANstruction. CanstructionÂ® combines the competitive spirit of a design/build competition with a unique way to help feed hungry people. Competing teams, lead by architects and engineers, showcase their talents by designing giant sculptures made entirely out of canned foods. At the close of the exhibitions all of the food used in the structures is donated to local food banks for distribution to pantries, shelters, soup kitchens, elderly and day care centers. The official Web site has pictures of this year’s winners, but I think it’s much more fun just to browse the Flickr photos tagged with “canstruction”. Check out the list of participating cities to see whether you can still catch the show somewhere. One of the things I miss the most from Hungary is food. Over the weekend I was cleaning up comment spam from months ago. In the process I discovered some legitimate comments people had left on this blog a while back. One of them pointed me to Bende.com, a store close to Chicago that sells Hungarian food. I contemplated driving out there, but realized it would be easier to order something online. Here is what I got: Hungarian salami, pickles, sauerkraut, herring in tomato sauce, plum halves compote and chestnut puré. I put in the order over the weekend and already had the products on Tuesday. I chose the cheapest/slowest shipping option. A friend of mine visited a few weeks ago and brought me delicious pancakes made from *drumroll please* over 40 ingredients! 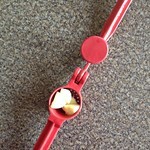 We played a guessing game: what’s in it? It had everything you can imagine and then some. It was also great. Although I haven’t quite adopted her approach to making pancakes, she has certainly inspired me to make my pancakes a bit more interesting. On Sundays, I purposefully take some extra time to enjoy the morning and this allows for some gourmet pancakes. This morning’s mix included the following ingredients in addition to the basics: chocolate chips (I always include those! ), dried fruits (cranberries, pineapple, apricots) and various spices (mint (! 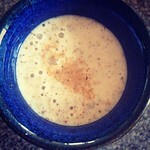 ), pumpkin spice, ground nutmeg). I didn’t have any fresh blueberries at home, but those are one of my favorite ingredients. In fact, the pancake pictured above is of one such mix. You are currently browsing the archives for the Food/Dining category.